In the current section, with all the weight on which we refelt it in to choose the ecstatic exemplifications, from the cause of their diversity, we will try to debate the theological consequences of the sight of God from Scripture. And namely, we will detect a number of fundamental details of the ecstatic sight, which will help us to understand the divine-human uniqueness of these personal events of salvation and the relation with God, of high intimacy, of the livers of these. The body, the soul and the breath of God, the divine grace, into a full unity, forms the The scriptural anthropology does not see on man, as on a full being, without the breath of grace in our being. Just the grace of God is the one who makes on man to be a living soul, which reigns over body and not a „dead” soul, which blunts the senses in the coarse materiality of the vices. The building of Eve from a rib of Adam (the same and in VUL: „unam de costis eius”) occurs into an ecstatic state of him. The first woman is born into a state of great ghostuality of her man and she is receipted by him in prophetic words, cf. Gen. 2, 23. But, from the textual lapidarity of the verse, emerge capital things for our discussion. We find a series of details which we will meet in all ecstatic contexts which we will analyze. We find, in the first row, that the ecstasy was at the initiative of God and that He pulled on man from time and He united him with His glory. The direct author of ecstasy is God and the one who experiences it is the man full of grace, ie Saint Adam. The notion of „sleep”, which appears in this context, does not enter in the normal parameters of what we know about the current biological sleep, but introduces us in the state of experiential rupture, which produces it the ecstatic sight. The ecstasy and the sleep are not congruent experiences. The ecstasy is a divine initiative in the life of a ghostual man, while the sleep is inscribed in „the normality” of our post-lapsarial condition. But the sleep is an excellent paradigm for to emphasize the fact of full introduction of which has an ecstasy in the state of seer of those revealed by God. 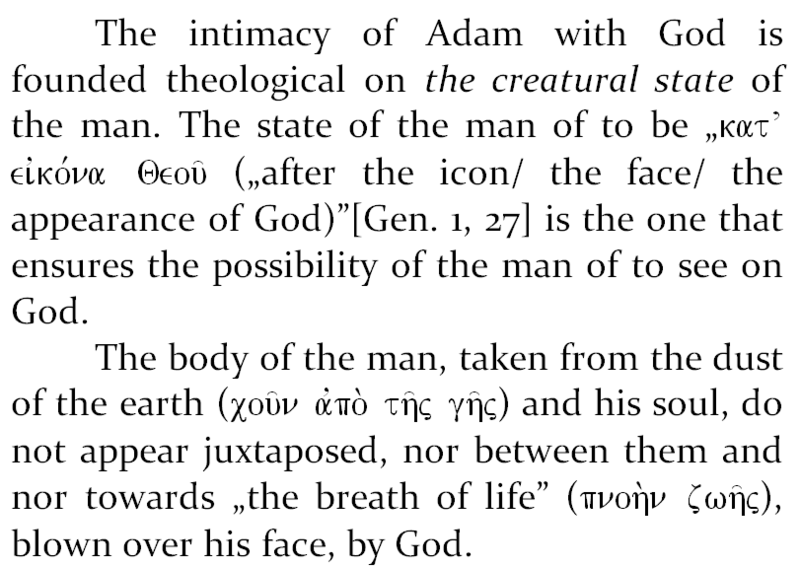 In the commentary at Hexaemeron of Saint Bede, we find at 1, 27, that the reference of Moses at the face of the Trinity from us is, of fact, the confirmation of the grace (confirmationis gratia) from our being, conf. Venerabilis Bedae, Hexaemeron, sive libri quatuor in principium Genesis, usque ad nativitatem Isaac et electionem Ismaelis, in PL 91, col. 30B. The appetency for the ecstatic understanding of 2, 21, in despite of scriptural literality, is low or inexistent. speaking thus about a supernatural state which Adam lives it at the creation of Eve. But neither Saint John does not insist on the explication of this supernatural state which Adam lives it. But Father Fecioru knew, certainly, that ecstasy means, in the first row, divine sight, but he conformed with a mode to translate in romanian language, in which is not followed the text of Septuagint, but is attempted, almost always, a translation melange of Scripture. Just therefore, the readers accustomed with the actual text of orthodox Scripture, in the ultimate editions, synodal, romanian, are surprised, shocked by the ghostual robustness of the Septuagint, for that we did not have and nor have we, with all recent attempts, an integral version of the Septuagint, which does not take account of other textual variants, but to be a translation, in itself, of the text. Saint John Chrysostom remarks textually this thing: „for he has uttered these through the prophesying grace, being inbreathed by the teaching of the Holy Ghost”, cf. Joannes Chrysostomus, In Genesim (homiliae 1-67), in PG 53, col. 122, apud TLG #112.53.122.49-#112.53.122.51.